[p.344] Brunel is most popularly known by his great work of engineering construction—the Thames Tunnel—consisting of a brick-arched double roadway under the river between Wrapping and Rotherhithe. In 1799, an attempt was made to construct an archway under the Thames from Gravesend to Tilbury by Ralph Dodd, engineer; and in 1804, the ‘Thames Archway Company’ commenced a similar work from Rotherhithe to Limehouse, under the direction of Vasey and Trevethick, two Cornish miners. The horizontal excavation, in the latter case, had reached 1040 feet, when the ground broke in under the pressure of high tides, and the work was abandoned; fifty-four engineers declaring it impracticable to make a tunnel under the Thames of any useful size for commercial progression. In 1814, when the allied sovereigns visited London, [p.525] Brunel submitted to the Emperor of Russia a plan for a tunnel under the Neva, by which the terrors of the ice of that river in the spring would have been obviated. The scheme which he was not permitted to carry out in Russia, he was destined to execute in London. 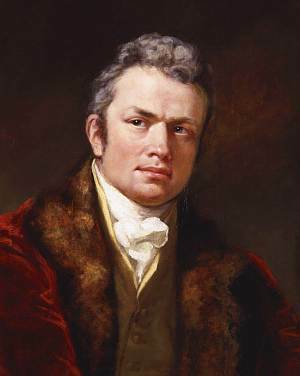 In 1823, Mr. Brunel appeared before the public with a proposal which, it was stated, had received the sanction of the Duke of Wellington and Dr. Wollaston. The mere idea of a tunnel below rivers is of course a matter of little moment, whoever the originator— the doing it is everything. The novelty of Mr. Brunel’s proposed mode of operation, therefore, was rightly judged of great importance. That gentleman has himself explained the origin of his idea. The author of the article Tunnel, in the Edinburgh Encyclopedia, states that he was informed by Mr. Brunel that the idea upon which his new plan of tunnelling is founded was suggested to him by the operations of the toredo, a testaceous worm, covered with a cylindrical shell, which eats its way through the hardest wood, and has on this account been called by Linnoeus, Calamitas navium. The same happy observation of the wisdom of nature led our celebrated countryman, Mr. Watt, to deduce the construction of the flexible watermain from the mechanism of the lobster’s tail. Great as was the confidence of Mr. Brunel in his shield, and the resources which he must have felt he had within himself ready for every difficulty, it is impossible that he could ever have anticipated the all but overwhelming amount of obstacles that he actually experienced, principally from the character of the soil, and the extraordinary influence which the tides exercised even at the tunnel’s depth. The first 9 feet of the tunnel (commenced with the new year 1826) were passed through firm clay. The clay was succeeded by a loose watery sand, where every movement was attended with imminent hazard. Thirty-two anxious days passed in this part. On [p.526] the 14th of March, substantial ground was again reached, and matters went on prosperously till September following,at which time 260 feet had been completed. On the 14th of that month, the engineer startled the directors with the information that he expected the bottom of the river, just beyond the shield, would break down with the coming tide. It appears he had discovered a cavity above the top of the shield. Exactly at high tide, the miners heard the uproar of the falling soil upon the head of their good shield, and saw bursts of water follow; but so complete were the precautions taken, that no injury ensued, and the cavity was soon filled by the river itself. Another month, and a similar occurrence took place. By the 2d of January 1827, 350 feet were accomplished, when the tide, during the removal of one of the poling-boards, forced through the shield a quantity of loose clay; but still no irruption of the river itself followed—the fear of which, from the commencement to the termination of the work, was continually on every one’s mind. ‘As the water,’ he writes, ‘rose with the tide, it increased in the frames very considerably between Nos. 5 and 6, forcing its way at the front, then at the back; Ball and Compton (the occupants) were most active. About a quarter before six o’clock, No. 11 (division) went forward. Clay appeared at the back. Had it closed up immediately. While this was going forward, my attention was again called to No. 6, where I found the gravel forcing itself in with the water. It was with the utmost difficulty that Ball could keep anything against the opening. Fearing that the pumpers would now become alarmed, as they had been once or twice before, and leave their post, I went upon the east stage to encourage them, and to choose more shoring for Ball. Godwin, who was engaged at No. 11, where the indications of a run appeared, called to Rogers, who was in the act of working down No. 9, to come to his assistance. But Rogers, having his second poling-board down, could not. Godwin again called. I then said to Rogers, “Don’t you hear?” upon which he left his poling for the purpose of assisting Godwin; but before he could get to him, and before I could get fairly into the frames, there poured such an overwhelming volume of water and sludge as to force them out of the frames. William Carps, a bricklayer, who had [p.527] gone to Godwin’s assistance, was knocked down and literally rolled out of the frames on the stage, as though he had come through a mill-sluice, and would undoubtedly have fallen off the stage had I not caught hold of him, and, with Rogers’ assistance, helped him down the ladder. ‘I again made an attempt to get into the frames, calling upon the miners to follow; but all was dark (the lights at the frames and stage being all blown out), and I was only answered by the hoarse and angry sounds of Father Thames’ roaring. ‘Rogers (an old sergeant of the Guards), the only man left upon the stage, now caught my arm, and gently drawing me from the frames, said, “Come away; pray, sir, come away; ‘tis no use, the water is rising fast.” I turned once more; but hearing an increasing rush at No. 6, and finding the column of water at Nos. 11 and 12 to be augmenting, I reluctantly descended. The cement-casks, compo-boxes, pieces of timber, were floating around me. I turned into the west arch, where the enemy had not yet advanced so rapidly, and again looked towards the frames, lest some one might have been overtaken; but the cement casks, etc., striking my legs, threatened seriously to obstruct my retreat, and it was with some difficulty I reached the visitors ‘bar’ (a bar so placed as to keep the visitors from the unfinished works), ‘where Mayo, Bertram, and others were anxiously waiting to receive me. ... I was glad of their assistance; indeed, Mayo fairly dragged me over it. Not bearing the idea of so precipitate a retreat, I turned once more; but vain was the hope! The wave rolled onward and onward; the men retreated, and I followed. Met Gravatt coming down. Short was the question, and brief was the answer. As we approached, I met I. [Isambard] Brunel. We turned round; the effect was splendid beyond description. The water as it rose became more and more vivid, from the reflected lights of the gas. As we reached the staircase a crash was heard, and then a rush of air at once extinguished all the lights. . . . Now it was that I experienced something like dread. I looked up the shaft, and saw both stairs crowded; I looked below, and beheld the overwhelming wave appearing to move with accumulated velocity. The diving-bell was now brought into use; the hole or chasm in the bed of the river was discovered, and 3000 bags of clay, armed with small hazel rods, were expended before it was effectually closed. In a few weeks the water was got under, and by the middle of August the tunnel was cleared of the soil that had washed in, and the engineer was able to examine his shattered fortifications. In all essentials the structure remained perfectly sound, though a part of the brickwork close to the shield had been washed away to half its original thickness, and the chain which had held together the divisions of the shield had snapped like a cotton thread. The enemy—so powerless when kept at a distance, so irresistible at its full strength—had driven deep into the ground heavy pieces of iron belonging to the shield. August 12, 1828, ‘with the workmen throughout the whole night, having taken my station there at ten o’clock. During the workings through the night, no symptoms of insecurity appeared. At six o’clock on this morning (the usual time for shifting the men), a fresh set came on to work. We began to work the ground at the west top corner of the frame. The tide had just then begun to flow, and finding the ground tolerably quiet, we proceeded by beginning at the top, and had worked about a foot downwards, when, on exposing the next six inches, the ground swelled suddenly, and a large quantity burst through the opening thus made. This was followed instantly by a large body of water. The rush was so violent as to force the man on the spot where the burst took place out of the frame (or cell) on to the timber stage behind the frames. ‘I was in the frame with the man, but upon the rush of water, I went into the next box in order to command a better view of the irruption; and seeing there was no possibility of their opposing the water, I ordered all the men in the frames to retire. All were retiring except the three men who were with me, and they retreated with me. I did not leave the stage until those three men were down the ladder of the frames, when they and I proceeded about twenty feet [p.530] along the west arch of the tunnel. At this moment, the agitation of the air by the rush of the water was such as to extinguish all the lights, and the water had gained the height of the middle of our waists. Here was a crisis indeed. The funds of the company were exhausted, and everything seemed against the successful continuation of the enterprise. The hole in the river-bed was reported by the divers to be very formidable. It was oblong and perpendicular, and measured about seven feet in length. Brunel, whose tenacity of purpose was immoveable, was almost in frenzy at this accident. So far, his plan had entirely failed. The hole was patched up in the bed of the river, forty thousand tons of earth—chiefly clay, in bags— being employed for the purpose, and the tunnel remained as substantial as ever. But for seven long years all further work upon it was suspended. The engineer’s star, however, though clouded, had not set. In January 1835, the Government, after many applications, agreed to make some advances for the continuation of the work, and it was once more resumed with energy. The progress at first was not much to speak of, even though the workmen worked energetically during the first eighteen weeks. It was only two feet four inches per week. In August 1837, a third irruption and several narrow escapes occurred. ‘The water,’ says Mr. Thornbury, ‘had gradually increased at the east corner since 2 p.m. on the 23d, rushing into the shield with a hollow sound, as though it fell through a cavity in the river-bed. A boat was then sent into the tunnel to convey material to block up the frames. Notwithstanding, the water gained upon the men, and rapidly rose in the tunnel. About 4 p.m., the water having risen to within 7 feet of the crown of the arch, it was thought wise for the men to retire, which they did with great courage, along a platform constructed by Mr. Brunel in the east arch only a few weeks before. As the water still continued rising, after the men left, Mr. Page, the acting engineer, and four others, got into the boat, in order to reach the stages and see if any change had taken place; but after passing the 600 feet mark in the tunnel, the line attached to the boat ran out, and they returned to lengthen it. This accident saved their lives, for while they were preparing the rope the water surged up the arch ten or twelve feet. They instantly made their way to the shaft, and Mr. Page, fearing the men might get jammed in the staircase, called to them to go steadily; but they, misunderstanding him, returned, and could hardly be prevailed upon to go up. Had the line been long enough, all the persons in the boat must have perished, for no less than a million gallons of water now burst into the tunnel in a single minute. The lower gas-lights were now [p.532] under water, and the tunnel was almost in darkness. The water had now risen to within fifty feet of the entrance of the tunnel, and was advancing in a wave. As Mr. Page and his assistants arrived at the second landing of the visitors’ stairs, the waves had risen up to the knees of the last man. The last feeble struggle of the river against its persistent enemy was in April 1840. About 8 a.m., it being then low water, during a movement of the poling-boards in the shield, a quantity of gravel and water rushed into the frame. The ground rushed in immediately, and knocked the men out of their cells, and they fled in a panic; but finding the water did not follow, they returned, and by great exertions succeeded in stopping the run, when upwards of 6000 cubic feet of ground had fallen into the tunnel. The fall was attended with a noise like thunder, and the extinguishing of all the lights. At the same time, to the horror of Wapping, part of the shore in that place sank, over an area of upwards of 700 feet, leaving a cavity on the shore of about 30 feet in diameter, and 13 feet in depth. Had this taken place at high water, the tunnel would have been filled; as it was, men were sent over with bags of clay and gravel, and everything rendered secure by the return of the tide. Sometimes sand, nearly fluid, would ooze through minute cracks between the small poling-boards of the shield, and leave large cavities in the ground in front. On one of these occasions, the sand poured in all night and filled the bottom of the shield. In the morning, on opening one of the faces, a hollow was discovered, 18 feet long, 6 feet high, and 6 feet deep. This cavity was filled up with brickbats and lumps of clay. One of the miners was compelled to lay himself down in this cavity, for the purpose of building up the further end, though at the risk of being buried alive. 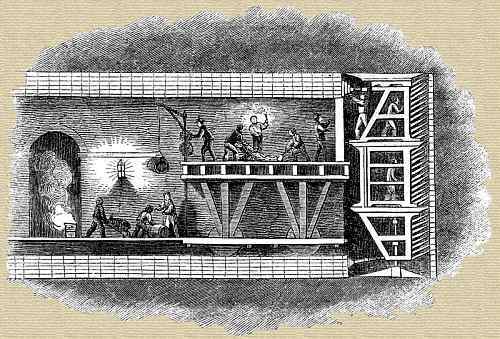 At last, on the 13th of August 1841, Sir Isambard Brunel passed down a shaft which had been opened to facilitate the work on the Wapping side of the Thames, and thence, by a small drift-way through the shield into the tunnel. The difficulties [p.533] of the great work had been at last surmounted. To give the statistics of the undertaking, the tunnel is 1200 feet in length. The carriageways were originally intended to consist of an immense spiral road winding twice round a circular excavation 57 feet deep, in order to reach the proper level. The extreme diameter of this spiral road was to be no less than 200 feet. The road itself was to have been 40 feet wide, and the descent very moderate. The tunnel is now turned into a part of the East London Railway. Sub-river tunnels, it may be added, are not unfrequent in the coal-mining districts of the north of England. The beds of both the Tyne and the Wear are pierced in this manner; while at Whitehaven, and at the Botallack mines in Cornwall, the bed of the ocean has been penetrated for long distances, the tunnel at the former place extending upwards of a mile beneath the sea. At the close of the last century, a Northcountry engineer proposed a sub-aqueous passage to connect North and South Shields, but the scheme was never carried out. The same gentleman then proposed the tunnel from Gravesend to Tilbury...; but it was soon abandoned as impracticable, as was also two Cornish miners’ proposal to connect Rotherhithe with Limehouse. Science Quotes by Sir Marc Isambard Brunel.